“but the stars are little holes pierced in that blanket by those who have done good deeds in this world. 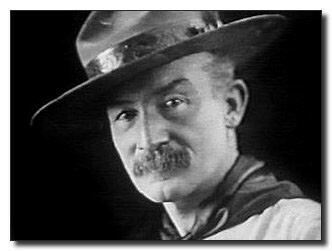 Lord Baden-Powell, the founder of Scouting, said: "I often think that when the sun goes down, the world is hidden by a big blanket from the light of heaven, but the stars are little holes pierced in that blanket by those who have done good deeds in this world. The stars are not all the same size; some are big, some are little, and some men have done small deeds, but they have made their hole in the blanket by doing good before they went to heaven. Try and make your hole in the blanket by good work while you are on earth. It is something to be good, but it is far better to do good." Think of Baden-Powell's words when you promise to help other people. 8 small or pen-type flashlights, one for each Cub Scout. Akela and 8Cub Scouts stand near campfire with the figure of the Big Dipper and North Star at one side of the fire. Cub Scouts stand behind the figure with lights that they flash behind their star in the Big Dipper as they speak. Akela: For thousands of years, people have grouped the stars together as figures in constellations. This was probably done by the early shepherds as they lay on the grass looking at the sky while tending their sheep. There they could see pictures of heroes, kings, queens, men, maidens and monsters in the stars. The constellation we know best is the Big Dipper. Taking the stars that form the outer edge of the Big Dipper sight upward and the bright star that you see is the North Star (Polaris), which for centuries has been the guiding star for travelers. (flashes his light in the cutout for the North Star.) It remains in the same place all the time. Let the North Star represent our God. Keep your eyes on the North Star. Each star in the Big Dipper can help you keep your eyes on the North Star - to become your guide for living. Then let your light shine that you can help others find the way. Now, each of seven Cub Scouts will tell what each star in the Big Dipper represents to him in his quest to find the guiding star. As they speak, they flash their light behind their star. Akela: A11 of these are excellent guides for us to follow on our Cub Scout Trail. Let each one help you as you travel onward. Good Night. I made a promise... I said that whatever I did I would do the best I could. I made a promise...to serve my God and my country the best I could. I made a promise...to help other people the best I could. I made a promise.. .to obey the Law of the Pack the best I could. I have done my best, and I will do my best because I am the best... I am a Cub Scout.